My newest Italian translation. The couple is a good match for John and Caroline. I love it when my publisher sends me a surprise in the mail. 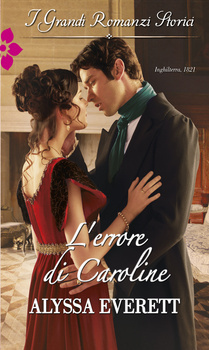 Today I learned I have a new Italian translation, L’errore di Caroline. It’s an Italian version of The Marriage Act. As in the case of An Heir of Uncertainty, the title pun must not work in Italian. I was thrilled to discover (a few days after the fact) that The Marriage Act made Romance Novels for Feminists’ Best of 2015 list. You can read the entire list (which also features author Rose Lerner, one of my talented critique partners) by clicking here. My thanks to Romantic Historical Reviews, and to reviewer Caz in particular, for including The Marriage Act on the site’s list of “Favourite Books of the Year.” You can read the entire list of 2015 HR highlights by clicking here. I got a lovely surprise in the mail today–a new translation of AN HEIR OF UNCERTAINTY. 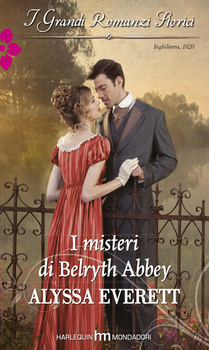 The Italian title is “I misteri di Belryth Abbey” (the pun must only work in English) and I absolutely love the cover! My newest regency romance, The Marriage Act, begins as a cross-country “road” story, with an unhappily married husband and wife forced to spend time in each other’s company as they travel through England. The road that the hero and heroine take out of London is a real thoroughfare, parts of which were already more than a thousand years old at the time of the Norman conquest. It’s called Watling Street, and it’s a Roman-engineered relic of the first century occupation of Britain. Before the Romans arrived in Britain, the native Britons had already established paths that ran from the English Channel to a point where the Thames was narrow enough to ford, then later split into separate western and northern routes. When the Emperor Claudius sent his legions to conquer Britain in 43 AD, the Romans made use of these routes in their new province of Brittania. They built a lighthouse and later a fort at Portus Dubris (the port of Dover), then a paved road that ran northwest to cross the river Stour at the Roman town of Duruvernum Cantiacorum (present day Canterbury). A model in the Museum of London of the Roman bridge across the Thames into Londinium. From there, the Roman road continued through present-day Rochester and on to Londinium (London). The Romans founded Londinium in 47 AD, building a bridge across the Thames and establishing a settlement on the north bank. That same winter, they paved the road that crossed the bridge. What we now know as Watling Street ran in a westerly direction through Londinium and was nearly thirty feet wide in places. Leaving London, it turned to the northwest in a straight line corresponding to the present-day Edgware Road and continued through Verulamium (modern day St. Albans) and beyond. The Roman word for a paved road was strata, and many towns and villages along the route owe their names to the old road, including various forms of “Stratford” and “Stretton.” The name “Watling Street” comes from a tribe that lived in the region of St. Albans, the Wæcelinga. This photo shows a view along Watling Street in the heart of London to St. Paul’s Cathedral. Roman rule ended in Britain in the late fourth century, and subsequent centuries saw first Saxon and, later, Viking invasions. In 878, Alfred the Great defeated the Vikings, who withdrew into East Anglia, Essex and Eastern Mercia, rendering Watling Street the boundary between the Viking (Danelaw) and Saxon sections of Britain. The road went through various stages of disrepair and resurfacing over the centuries, but for the most part it remained well-traveled. Chaucer’s fictional pilgrims in The Canterbury Tales employ the London-to-Dover stretch of Watling Street in the late 1300s, and during the Great Fire of London in 1666, the diarist Samuel Pepys mentions how he “…walked along Watling Street as well as I could, every creature coming away loaden with goods to save – and here and there sick people carried away in beds.” Rebulding the church of St. Mary-Le-Bow after the fire, Sir Christopher Wren’s workmen discovered sections of the old Roman paving, and incorporated stones from the Roman road into the church foundation. Watling Street rose to greater prominence in the coaching era, and the first turnpike trust in England was established in 1707 to re-pave parts of it. Inns along the route thrived. The southeastern section of the road, from London to the coast, became known as the Great Dover Road. To the west, civil engineer Thomas Telford improved communications between London and Dublin by extending the road all the way to the port of Holyhead in Wales, an undertaking completed in 1826. It’s this section of Watling Street–the Holyhead Road–that my characters travel in The Marriage Act. Today, the Great Dover Road is known as the A2, and the Holyhead Road is roughly the A5, though the name “Watling Street” is still in use at many points. You can even find evidence of the Roman occupation, such as sections of the ancient city walls in St. Albans. Not only did Watling Street link the eastern edge of Great Britain, the coast of Kent, with the western edge in Wales, but we owe much of the London we know today to the old Roman road and the settlement that grew up around it. I hope you’ll take a look at The Marriage Act, and that reading it gives you a feel for what traveling along Watling Street might have been like during the golden age of coaching in the early 1800s. If you enjoy “second chance at love” romances, you’ll find lots of drama in this story of a married couple bringing their relationship back from the brink of disaster. When John, Viscount Welford, proposed to Caroline Fleetwood, the only daughter of the Bishop of Essex, he thought he knew exactly what he was getting—a lovely, innocent bride. Five years later, he knows better. The woman who ran to another man on their wedding night—after they’d consummated the marriage—is hardly innocent. Years spent apart while John served as a diplomatic attaché have allowed them to save face in society, but all good pretenses must come to an end. When Caroline receives word that her father is dying, she begs John to accompany her on one last journey to see him. But there’s an added problem—Caroline never told her father that her marriage to John was a farce. As they play-act for others, Caroline is delighted to find she never really knew her husband at all. But can she be the kind of wife he needs—and does she want to be? To order or learn more, just click here. “Off for the Honeymoon” by Frederick Morgan shows a regency couple about to embark on married life. Click here to read author Sarah Price’s review of The Marriage Act. Thanks, Sarah, and I’m glad you enjoyed the book! Are you a “professional reader” of romance–a book blogger, librarian, reviewer, or member of the romance community who reads and recommends books online? Advance copies of my July release, The Marriage Act, are now available on Netgalley. Just click here to jump to its Netgalley page. For those without Netgalley access, don’t despair. You can pre-order The Marriage Act now from Amazon. Just click on this link. Everett (An Heir of Uncertainty) ignites sparks between wedded strangers in this tender Regency romance. Caroline, Lady Welford, has just been reunited with her husband, John, Lord Welford, after he served five years in diplomatic service. She believes that her father is dying, and John agrees to travel with her to her father’s home in Kegworth, where they will pretend to have a perfect marriage. But John still hasn’t forgiven Caro for trying to run off with a militia officer on their wedding night. Throughout their lengthy journey and subsequent stay in Kegworth, they begin to not only work through their misunderstandings but learn to forgive and trust. But Caro’s cousin Sophia’s flirtations with John threaten to destroy their newfound truce. Caro is an especially strong and determined heroine, whose ability to persevere despite her husband’s desertion of her makes her a very admirable character. Intense and ever-present romantic tension propel the novel to its emotional conclusion. So, yay! Waiting for the first review(s) to come in for a book can be scary, and The Marriage Act is a bit edgier than my previous four romances, so I’ve been holding my breath. I find it interesting that PW singled out the heroine as admirable. The book features a married couple who are at war with each other, and, so far, readers tend to come down strongly on either the hero’s side or the heroine’s–but it’s running 50/50 as to which of the two characters is more sympathetic.